Eighty miles off the coast of mainland Scotland, the archipelago of St Kilda is host to almost a million seabirds each summer. 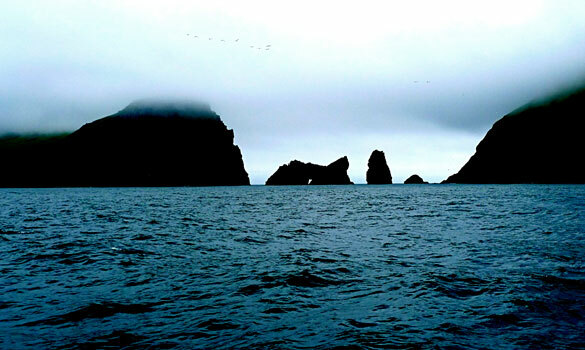 Beginning underwater, this journey takes in the remote island group – with its gurgling seawash, gannets and storm petrel – before sailing east to the Shiants, home to puffins, guillemots, fulmars and razorbills. Finally, a mix of the exotic and commonplace – Carrion crow, wren, herring gulls. heron, ringed plover, cuckoo, oystercatcher, song thrush, common sandpiper – heard at dawn on the island of Rhona. Sound and photography: Pascal Wyse and Tom Haines. Recorded in June 2009 with Dolphin Ear hydrophones, Sennheiser and DPA microphones and Sound Devices recorders.